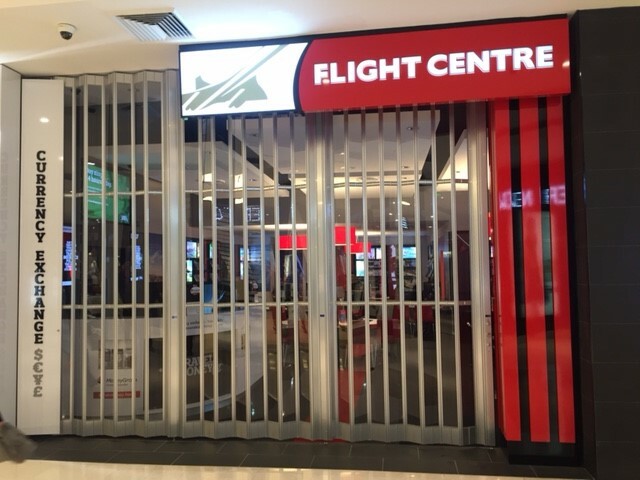 The Australian Trellis Door Company™ (ATDC™) is installing its quality range of commercial folding closures at Flight Centre Group stores across Australia. ATDC has installed both its FC1 wide body (300mm panel) and Slimline FC2 (150mm panel) folding closures with polycarbonate infill’s across the Group’s stores. With a maximum opening height of 4500mm, ATDC’s lightweight folding closures can span any opening width in either a straight-line or curved or S-bend configuration. Suspended with industrial grade top roller bearings from a heavy duty extruded aluminium top track, the curtain’s extruded aluminium sections fold effortlessly through a system of low friction continuous interlocking hinges resulting in an exceptional user friendly finished product which is low maintenance and easy to operate. All complemented by a series of easy to use keyed-alike, seamless up/down locking mechanisms. Emergency break out doors are available for egress under the BCA where required. See the ATDC website for Folding Doors & Shop Doors. The folding closures are available in a natural anodised or powder coated finish. Other infill options include toughened glass, solid aluminium or perforated mesh for added ventilation. Read our article on our Bifold Door installation with WH Smith. Other typical applications include securing shopping centres, banks, kiosks, hotels, counter tops, airports, counter tops and reception areas. The absence of a bottom track is a major advantage as there is no trip hazard during trading hours. ATDC’s cutting edge folding closures are sold in Sydney, Melbourne, Brisbane, Adelaide, Perth, Canberra, and Darwin and are exported to Hong Kong, Singapore, Brunei and throughout South East Asia, The Pacific Islands and the UAE. For more information on ATDC’s full range of commercial folding closures please visit www.trellisdoors.com.au or contact ATDC toll free from anywhere in Australia on 1800657435.